‘Church looking for an investor who wants to develop an [sic] condominium project … You can build a nine-story building above,” read the Prudential Douglas Elliman Web listing for the small, run-down St. Samuel’s Temple Church of God in Christ on East 125th Street. It wrapped up like a personal ad: “Looking for the right party for a mutually rewarding relationship.” Welcome to the unseparation of church and real estate. Sensing that resistance is futile, churches, especially in uptown Manhattan, are openly inviting developers to loom overhead, or even demolish and replace their aged buildings, as they try to manage the tide of change engulfing their neighborhoods. It’s an if-you-can’t-beat-them attitude few churches have embraced until now: More often, they’ve been supporting community protests and fighting new construction. “If churches are to continue to serve the community, it’s a blessing to have a developer come in and do a joint venture,” says St. Samuel’s broker, Elliman’s Amanda Jhones. This approach has many houses of worship—synagogues and mosques, too—negotiating for extras to benefit residents left behind by gentrification. 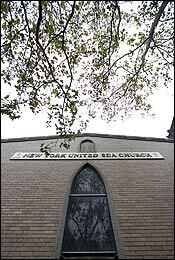 “We can’t stop it, so we might as well bring in programs that will help the community and have them be paid by the developer,” says George Whiteman, associate pastor of the New York United Sabbath Day Adventists Church (pictured), which, with the help of Jhones, is courting investors for its 110th Street site. In exchange, the church wants a new sanctuary as well as a recreation center for teens and senior citizens. Model, ApartmentSupermodel Karolina Kurkova is the latest celebrity to be lured to River Lofts, the buzz-heavy Tribeca development on Laight and Washington Streets. Records show that the Victoria’s Secret lovely paid $2.317 million for her apartment, which has three bedrooms, three baths, and direct water views. The condo complex, designed by Ismael Leyva and Tsao & McKown, is quickly becoming a celebrity magnet on the order of Time Warner Center and Morton Square; Kurkova’s high-profile neighbors include Meryl Streep, who reportedly paid approximately $9 million for the penthouse, and Gotham magazine publisher Jason Binn (whose presence is perhaps the best indicator out there that a celebrity is nearby). And that’s not all: Pop princess Hilary Duff is rumored to have snapped up a rental in the handsome building, which has “smart” elevators, an indoor garage, and a private garden. Larry Kruysman, sales manager of the Sunshine Group, which is marketing River Lofts, declined to comment on Duff’s deal. Downtowners typically move to Washington Heights to upgrade to a grander space, and these two co-ops in the Riviera—a 1910 building whose previous tenants include Random House publisher Bennett Cerf and civil-rights leader Stokely Carmichael—certainly meet that requirement. Both have also undergone complete kitchen-and-bath rehabs. In fact, they’re comparable in every significant way except one: 4D has a large eat-in kitchen (3A’s is an oversize galley) and a full-size washer and dryer. For the families shopping for big prewars like this, the prospect of a Norman Rockwell-esque dinner around a big table is worth an extra $200,000. The Facts: Three-bedroom, two-bath, 1,600-square-foot co-op. Broker: Kelly Cole, the Corcoran Group. The Facts: Three-bedroom, two-bath, 1,650-square-foot co-op.